There was nothing of the sansho (Japanese pepper) growing in Wakayama prefecture to find just while hiking the Kumano Kodo pilgrimage path; other places would have taken long to get to and were not exactly comfortable to reach in the rain. So, I paid all the more attention to any and all traces of spice I could find. 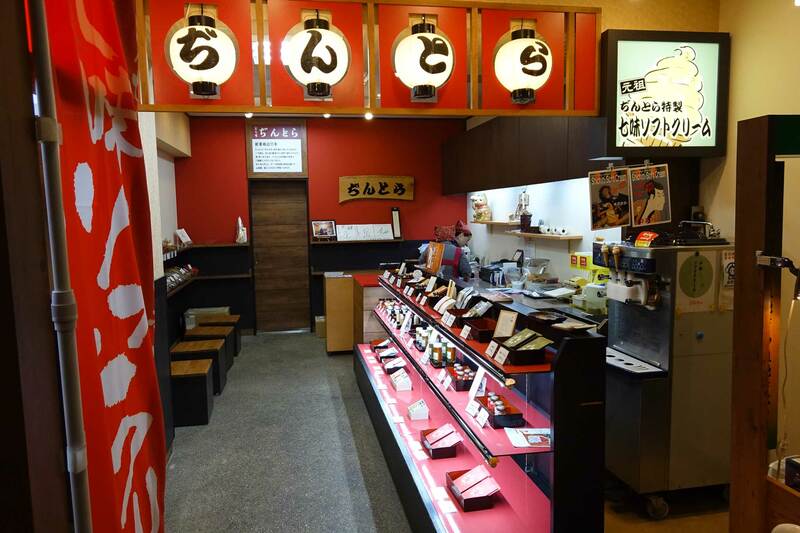 Some of that, as you might have already noticed, was in restaurants: I went to many an udon, soba and ramen place, and for those noodle dishes, it is usual that shichimi, ichimi and/or sansho (or all three) are offered. Ichimi, to start where it is the most simple, is nothing but chile pepper powder. The name translates to “one flavor”, and that one is that of chilli. The trend flavor of yuzu, a Japanese variety of citrus fruit, has also reached these spices; yuzu is to be found in various shichimi (see below) as well as mixed with chilli to make yuzu ichimi (which is actually a bit funny, given that this “one flavor” then is really a “two flavor”). Shichimi, “seven flavors” is a spice mixture based around chilli and – surprise – six other flavors. It would not be quite correct to call them spices, as shichimi often includes yuzu citrus peel flakes, hemp seeds and similar ingredients. Aside from the chilli, however, the ingredients are quite variable, potentially including sansho, orange peel (if not or in addition to yuzu), black and/or white sesame seeds, ground dried ginger, nori seaweed, poppy seed, and/or shiso. It is one of the more interesting spicy mixtures to me, even as I don’t much care for it, especially as it comes from Japan. After all, Japan is renowned for the “purity” of flavors its cuisine supposedly emphasizes – and which shichimi in its clashing flavors and boldness alone puts the lie to. It is all not that easy, certainly not when it comes to noodle dishes and (other) dishes employing the strong flavors that interest me so. Sansho, of course, is the Japanese pepper. It is Zanthoxylum, just like Sichuan pepper, but should be Zanthoxylum piperitum rather than any other species. That, however, is a story we are still exploring in these pages. One place I already knew (via their products) is Ocha-no-ko Saisai. 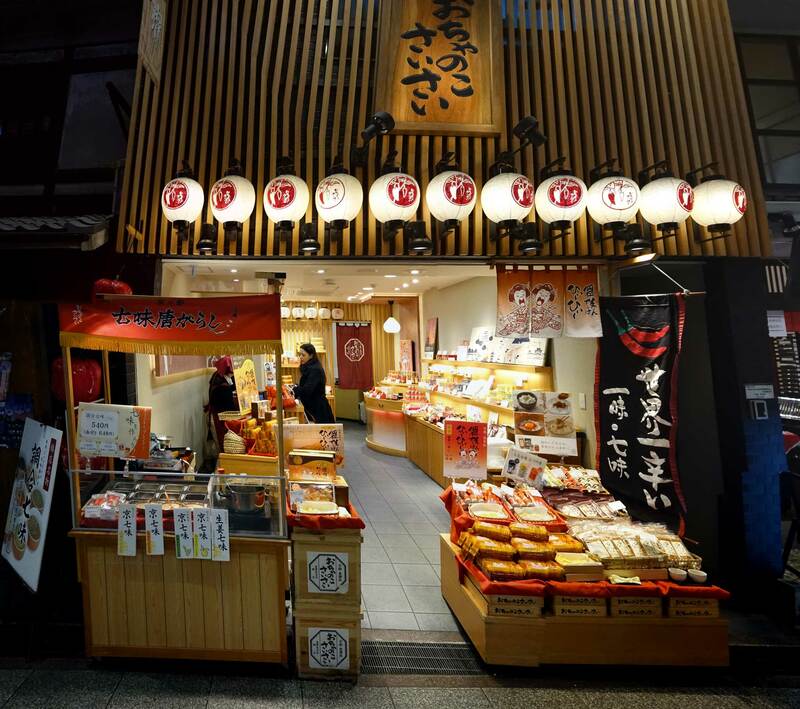 They have a little store in Nishiki Market (and other stores in other places), and are an interesting source of different kinds of ichimi and shichimi, as well as other spicy things. Of quite some interest is that they make these wares not only from the usual red, but also from yellow and black (smoked, at least supposedly) chile peppers. And they also use quite a bit of habanero, which somehow has received quite some attention in Japan. Funnily, it is from their habanero things that I know of the Japanese expression “hi-hi” (pronounced like “hee-hee”) as an expression of extra-hot flavors. I thought that this might be just their way of putting it, but then actually found somebody else, back again in Tokyo, using that expression as well. 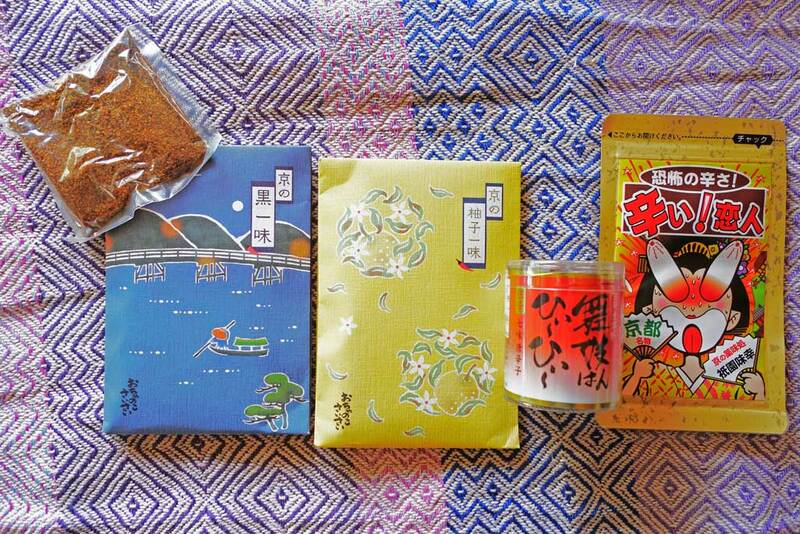 There is also dashi (stock), extra-hot rice crackers and, a personal favorite of mine, a Kyoto Chili-oil furikake. 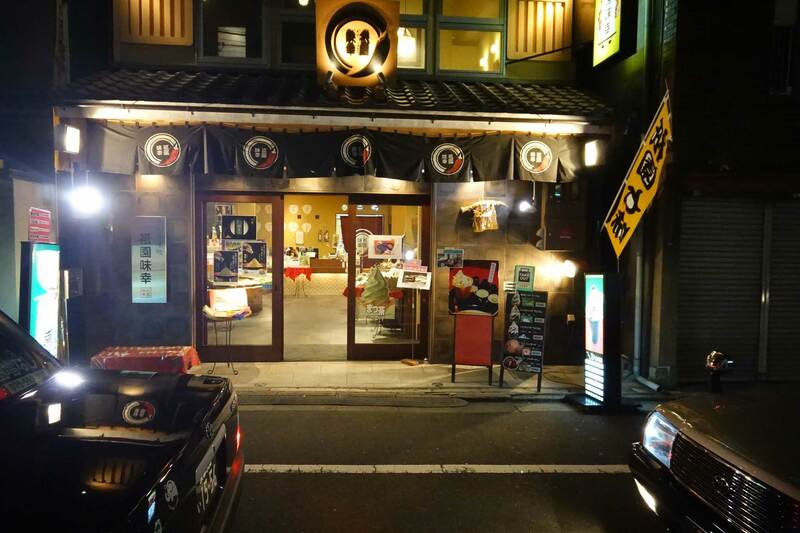 Basically just across the road from Ocha-no-ko Saisai is Jintora. The unassuming shop is much more laid back in colors as well as selection than the former brand, but they seem to usually have the sansho pepper mill right out front when they are open. Again, one can find shichimi, ichimi, and sansho. Here they even had two different kinds of sansho, though, one of them from Wakayama – if we understood each other right – where I had initially wanted to go looking for it myself. 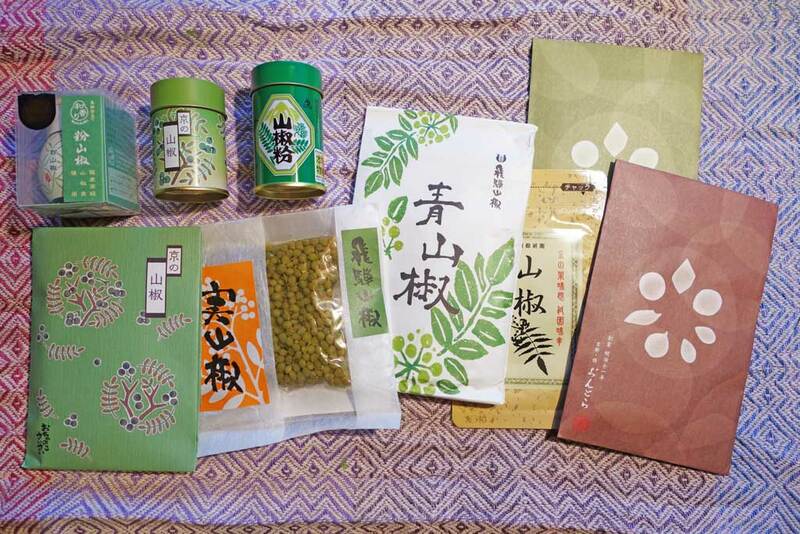 That I couldn’t, but at least I did bring back some of the different kinds of sansho they had. Oh, and they would also have had the usual bamboo containers used for shichimi and sansho. 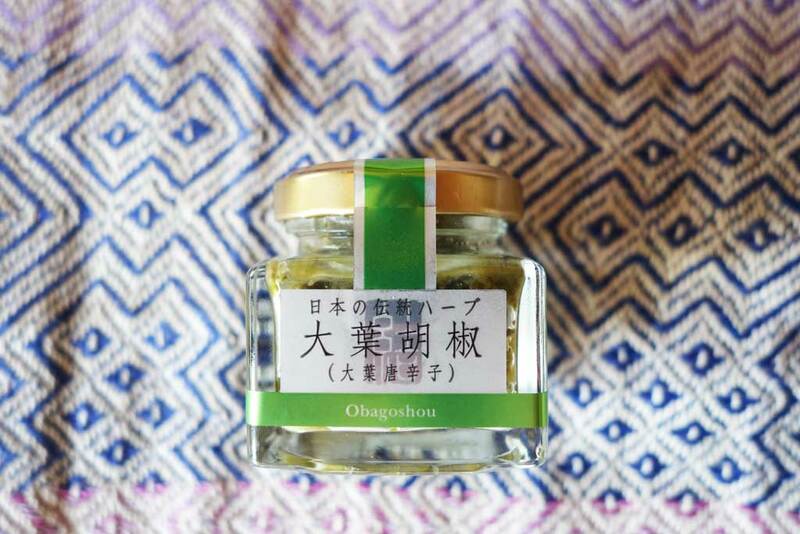 Some of these are visible on the photo from my soba at Honke Owariya. (And something tells me I will want to abuse some of the bamboo in my garden to try and make some myself). On the way east towards Gion along Nishiki Market, there are a few shops selling pickled vegetables… and one of them really made it worth my while to pay close attention to what I was seeing. Turned out, they were offering hon-hana-sansho (pickled sansho flower), a pickle of sansho flower and bamboo shoot, pickled sansho leaves, sansho konbu (with seaweed), yawaragi consisting of seaweed and baby sardines and sansho, and ajihamaguri (shellfish and powdered sansho), green pickled ao-mi-sansho and black pickled kuro-mi-sansho. I feel like Bubba in Forest Gump with his shrimp-this and shrimp-that, only it’s sansho-this and sansho-that – and I had no idea sansho pickles were even being made, let alone from the flowers as well as the leaves! Not in Nishiki Market but over the river into Gion (the famous geisha quarters of Kyoto) and immediately off into a side road is the store of Gion Ajikou. Frankly, I had a quick look around only, then fled. Not at all because it was bad. 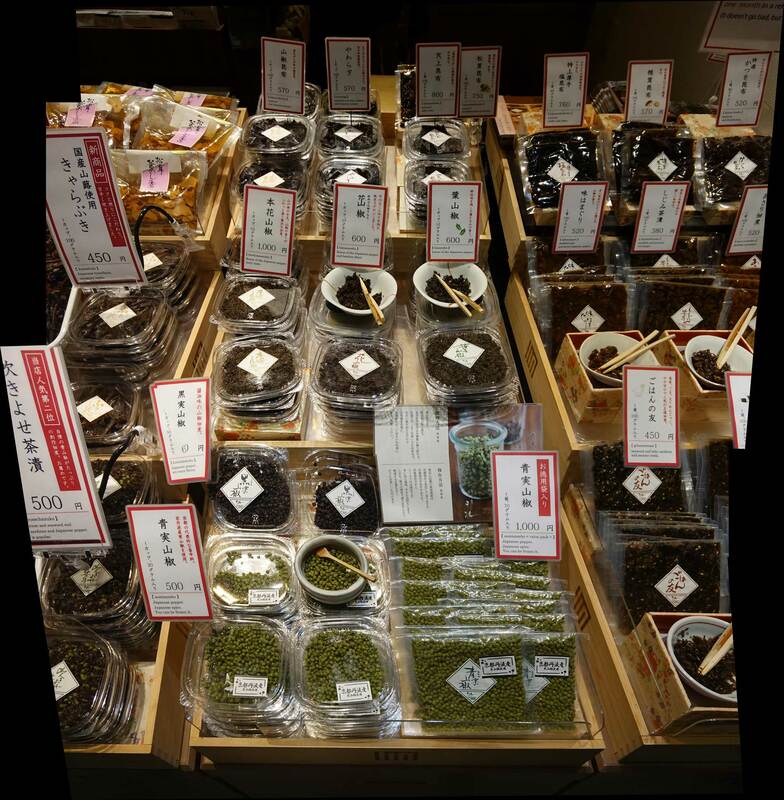 They were just close to the end of business hours and have such a wide selection of ichimi and shichimi (and some sansho), again, that I just didn’t know how to decide and couldn’t well avoid deciding by simply getting one of each. Again, it is quite interesting how they mix spices, have introduced a yellow pepper into their repertoire… but I’d really need to get back and have more time and Japanese skills to really get deeper into all that. Now, it is time to actually try out some of the spices I brought back, to grow more, and to use the inspiration. All the more so as there was more than just the pickled sansho that I could try and produce myself. 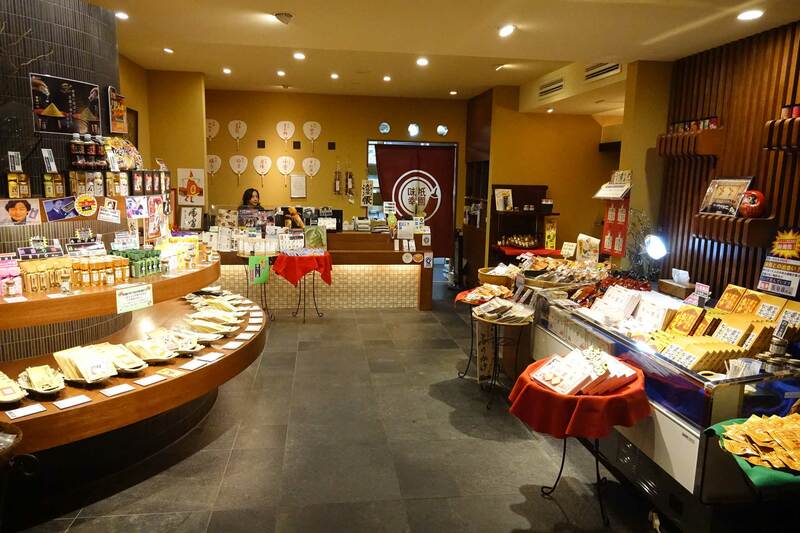 No, fascinatingly, the very first place I had gone into in Nishiki Market had not only had – and was able to tell me that it was – the budo (“grape”) sansho from Wakayama that I would have loved to find the source of. They also had a green chile pepper sauce that looked interesting. So, I went looking for (and found) some more insight into the use of sansho, but I also came back with more and more uses of shiso that I never knew this pretty and easy herb that seems to have fallen in love with my garden also had.